FLYING an airplane is usually regarded as being a thrilling sport in itself—but being thrown off the deck of a battleship, flung into the air like a pebble tossed by a gigantic slingshot, is not only thrilling sport, but an every day incident in the life of one of Uncle Sam’s crack navy pilots. Flying from carrier decks in land planes and shooting off catapults aboard battleships test the skill of the aviators and the latter proves one of their most interesting and exciting experiences. 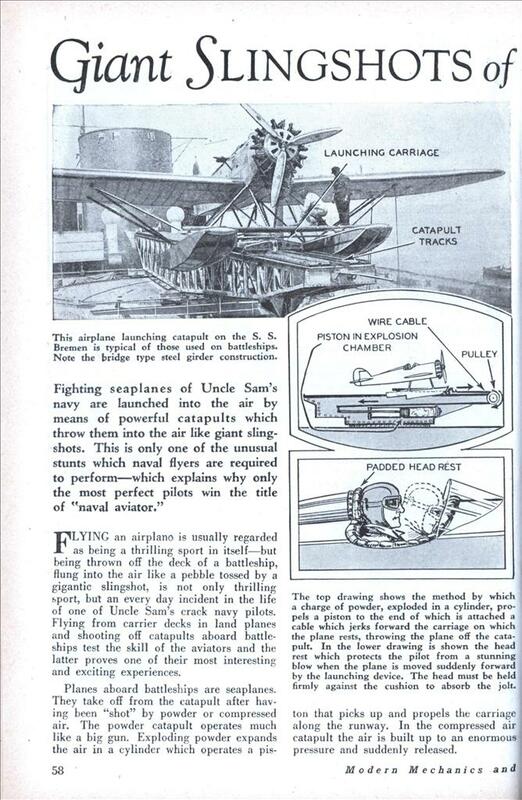 Planes aboard battleships are seaplanes. They take off from the catapult after having been “shot” by powder or compressed air. The powder catapult operates much like a big gun. Exploding powder expands the air in a cylinder which operates a pis- ton that picks up and propels the carriage along the runway. In the compressed air catapult the air is built up to an enormous pressure and suddenly released. The plane is held securely to the carriage to prevent its soaring away before reaching the end. A tripping mechanism automatically releases it at the proper moment, however, and plane and pilot climb rapidly into the air. 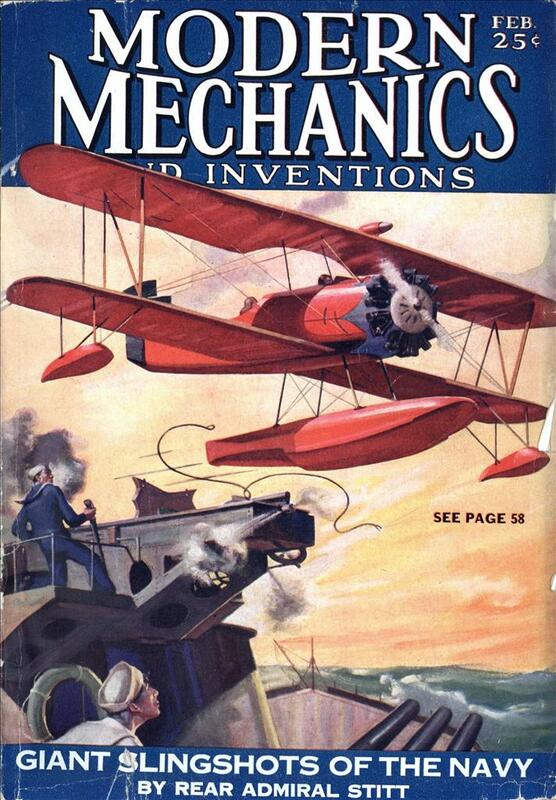 In a catapult takeoff the pilot must guard against the sudden jolt by holding his head firmly against a cushion. The sensation resembles that of being struck sharply by a human hand just below the base of the neck. Lt. Rhea Taylor, commander of the squadron aboard the U.S.S. Omaha, flag- ship of the Destroyer Squadrons, Battle Fleet, in taking a younger pilot aloft from a catapult recently had an unusual experience. “On this flight,” as he relates it, “I was in the after cockpit as passenger. On my first catapult flight, I recalled, the force of the shock caused me to pull the throttle back and I almost dived into the water. “Fearing my junior pilot might do the same thing 1 sat there with one hand shoving the throttle full open while with the other I hugged a radio set against my stomach. Having taken the air, the catapulted plane must get down again at the conclusion of the flight. If the battleship happens to be at sea the landing may be complicated. In a long, rolling, glassy swell the pilot must land with the swell regardless of the wind. He picks the top of a crest and settles down on it. If he tries to land across crests, he may and probably will nose his pontoon under and turn his plane over. Possibly the most difficult landings are in a choppy sea where conditions are favorable for a turn-over. The “naval-aviator,” a hard – won title, who achieves the right to represent Uncle Sam in the cockpits of his aerial eyes does so only after rigorous training. His physical qualifications are first determined, then flight surgeons examine his mental makeup to determine whether he is of the type who will continue year after year to enjoy the duties imposed on him. Once through the preliminary and advanced training, he sets forth monthly on exercises in which his aerial work is coordinated with that of surface ships. He becomes at once an adjunct to the battle ships and their defender against attack from the heavens. Throughout his career flight surgeons watch him to make sure he is not “getting up his wind” or going stale. If, perchance, he suffers some accident they examine him to learn whether he suffers a permanent nervous reaction. The aviator, once in the air, cannot be watched. He flies alone in the trim little fighters and must be thoroughly reliable. Mistakes are too costly both to the flyer and others depending on him to permit a mental failure. You can understand why such care is taken of the pilot when you realize he may be called on to lake off from a land station, rendezvous 150 miles at sea with a carrier and land on the small area of after-deck permitted for landings. The secret gear provided for bringing his flight to a rather abrupt halt would avail him nothing should he “land in the air,” “over shoot” or crash into the stern because of too low altitude. Navy flyers must be absolutely and not relatively precise. As a result they are the best trained aviators in the world. Theirs is a career offering at once danger and pleasure. The danger largely disappears if they are mentally awake, but let their brains slow down and it appears again. Thus they become as automatic in their decisions and movements as the machines they operate. Aviators in order to meet the peculiar needs of navy aviation must be able to think and act almost automatically. Otherwise they cannot meet sudden emergencies. Their flying becomes at once so rigorous and exacting that nerves, in the popular sense, cannot be tolerated. The navy aviator must be ready for a dog fight in the clouds, a cross country flight under adverse conditions or a “prevision” landing on the small area provided on the carrier flight deck. The latter requirement is one reason we require the aviator to possess “super-normal” vision, with excellent depth perception and accommodation. Selection of navy aviators lias become in a large degree a psychological problem. His physical abilities may be accurately measured according to standards already established. When it comes to measuring his temperamental adaptability, his power to continue to fly under the strain without going stale, the flight surgeon faces a more difficult task. During the war the specialists in medical aviation attached the greatest importance to normal functioning of the internal ear, as determined by the Barany chair turning tests; although psychologists insisted that methods for determining the temperamental qualities of a candidate for aviation were paramount. Fascinating stuff. Thanks for posting! Looks like I was wrong: They’re not using steam, but gunpowder! Wow. The new Gerald R. Ford class carriers switch from steam to electromagnets because it allows for more precise control and less stress on airframes. I can’t imagine what this would have been like! “….almost as important to the ship as her 14in guns.” Now there’s a statement full of forewarning in hindsight. The problems with airplanes on ships has never really been launching them, as this article demonstrates, but recovering them. If it wasn’t for recovery problems everyone would have ‘Aircraft Carriers’.